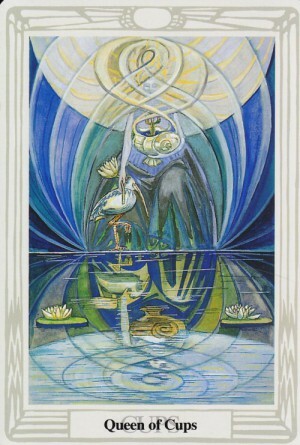 Another card associated with Cancer (besides The Chariot) is the Queen of Cups. This lady is pure emotion. But, like Cancer, she can hide what she's really feeling. Therefore, this card is associated with secrets and emotional undercurrents. Not big, life changing secrets (like the High Priestess). This Queen represents the daily issues that you or someone else doesn't want to talk about. The secret crush. The little things in a relationship that can become big things if you don't discuss them. She loves without boundaries and represents a psychic level of empathy and compassion. This card always indicates strong emotion, but she's never 100% exposed. When you pull this Queen, there's something else that needs to be discussed. When you see her, ask what's being held back. It doesn't have to be negative, but everything is not on the table. If reversed, she can be downright moody, pouty and manipulative. Or, this reversed Queen can point to someone who needs to work on healthy boundaries. Since all Queens represent the energy of attraction, the Queen of Cups is about attracting through intuition, empathy, compassion or creativity. Or (conversely) attracting by feeling like a victim. The surrounding cards will tell more of the story.